Once upon a time in ancient Egyptian, a royal bloodline ruled, one that would live on in the annals of history, Pharaoh after Pharaoh, until at last there were no more ... a new era of learning and experience taking hold. The Pharaohs, aligned themselves to their pantheon of gods - in belief, ritual, and ceremony. Pyramids and other stone monuments were constructed to honor the Pharaoh both while he was alive and in the afterlife. Among the more famous Pharaohs were those of the 18th dynasty. They included King Tutankhamen, his father Akhenaten and his grandfather Amenhotep III. Each of these Pharaohs made his mark in history. Putting together their stories left for the archaeologists for decades to come. There would always be another statue, amulet, relic, tomb and more. The energies of ancient Egypt forever calling souls home to a pyramid allegedly built by Khufu - perhaps a man, perhaps a god. Today we find this story about Amenhotep III. An ancient statue of King Tut's grandfather, Amenhotep III was revealed at the tomb where he was buried. King Tutankhamun, Egypt's boy king, ruled from 1333 B.C. to 1324 B.C., during the period of ancient Egyptian history known as the New Kingdom. Though he is possibly the most well-known of the Egyptian pharaohs, many mysteries still exist about the life, death and parentage of King Tut. The red granite statue of Tut's grandfather, King Amenhotep III, is about 4 feet by 3 feet (1.3 meters by 0.95 meters) and depicts the Egyptian pharaoh wearing the double crown of ancient Egypt, which is decorated with a sacred asp, or uraeus, according to the blog of archaeologist Zahi Hawass who currently serves as Secretary General of the Supreme Council of Antiquities (SCA). Amenhotep is seated on a throne next to the Theban god Amun. The ninth ruler of the Eighteenth Dynasty, Amenhotep III (about 1390-1352 B.C. 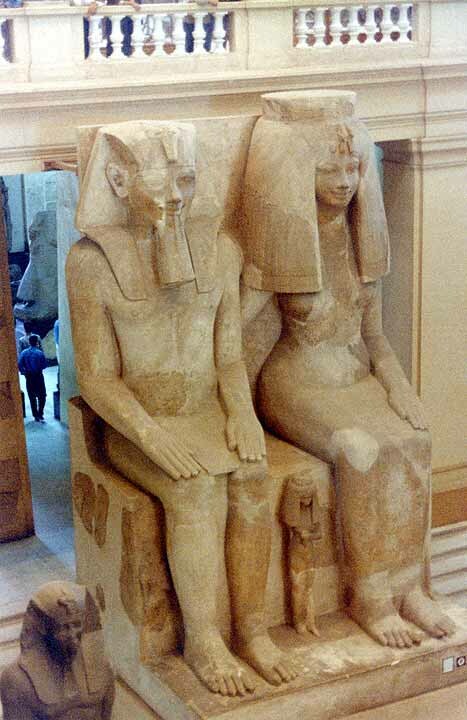 ), reigned for 38 years during a time when Egypt was at the height of prosperity and cultural development. His mummy was found in 1898 in a tomb dubbed KV35 by French Egyptologist Victor Loret. The upper part of the more than 3,000-year-old double statue has been dug out at the site of the pharaoh's funerary temple in Kom El-Hittan, in the west bank of Luxor. "The statue is one of the best new finds in the area because of its expert craftsmanship," Hawass said in his blog. Sabri Abdel Aziz, head of the SCA's Egyptology sector, said a similar statue, which showed the king seated beside the solar god, Re-Horakhti, was previously unearthed at the site. In February a massive granite head depicting Amenhotep III was dug out at the same site. "It is possible that a large cache for King Amenhotep III's statuary may have been buried in the area," Egyptian officials said in a statement. Egyptologists are hard at work to pin down King Tut's family tree. Candidates for King Tut's mother and father were recently identified using DNA analyses from royal Egyptian mummies. Hawass and colleagues analyzed the DNA of 11 royal mummies of the New Kingdom, both to search for any signs of genetic disorders that could have killed Tut, as well as to establish familial relationships between them. In addition to Tutankhamun, 10 mummies (circa 1410-1324 B.C.) possibly or definitely closely related in some way to Tutankhamun were chosen as part of the family-tree study; of these, the identities were certain for only three. In addition to these 11 mummies, five other royal individuals dating to the early New Kingdom (circa 1550-1479 B.C.) were selected because they were distinct from the supposed members of the Tutankhamun lineage Ñ a sort of mummy control group. Genetic fingerprinting allowed the construction of a five-generation pedigree of Tutankhamun's immediate lineage. The researchers were able to definitively identify several of the anonymous mummies or those with just suspected identities, including Tiye, mother of the pharaoh Akhenaten and grandmother of Tutankhamun. Another mummy is thought to be Akhenaten, father of Tutankhamun. What really killed King Tut? King Tut died at age 19 in about 1324 B.C., but the forensic evidence gathered from his mummy has led researchers to several different conclusions about exactly what killed him. DNA results suggest a combination of malaria infection and a bone disorder took down the king. In February, Egyptian researchers found genes specific to a parasite that causes malaria in Tut's DNA. The team, led by Hawass, theorized that the malaria infection proved deadly for the young Egyptian king, because he also suffered from a condition in which poor blood flow to the bones leads to the weakening or destruction of areas within the bones. Tut had sustained a sudden leg fracture, possibly from a fall, which might have resulted in the life-threatening condition that killed him when the malaria infection occurred, according to the findings, which were published in the Feb. 17 issue of the Journal of the American Medical Association (JAMA). Of course, these conclusions are hotly debated, and some researchers think that sickle cell disease (SCD), a genetic disorder in which red blood cells become dangerously misshapen, may have been the real cause of King Tut's death. Even though the boy king died in the ninth year of his reign at age 19, he is believed to have conceived twins with his wife, Ankhesenamen, the daughter of Nefertiti. Two tiny mummified fetuses were found in Tut's tomb in 1922, and were declared to be Tut's daughters by Robert Connolly, senior lecturer in physical anthropology at the University of Liverpool, when he analyzed the tomb of the Egyptian Pharaoh in 2008.